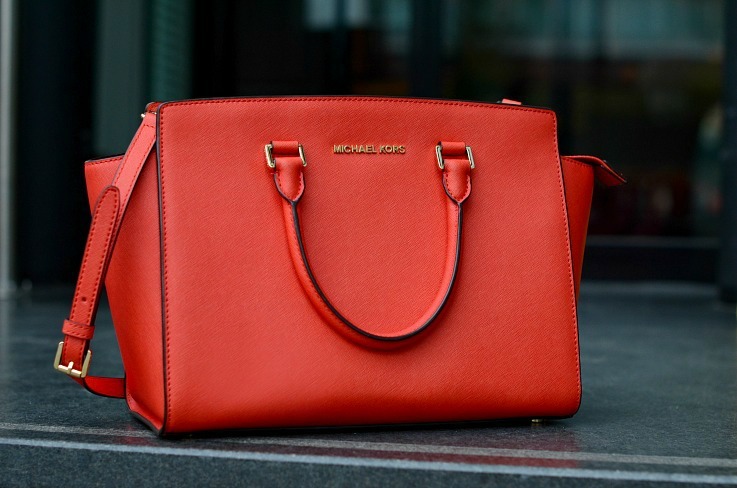 Today’s post is all about this fabulous stunner of a red Michael Kors bag called the Selma bag. I have been on the look out for the perfect red tote bag for quite some time and been looking around online and tons of stores out here in Amsterdam. I was contemplating on the Valentino glam lock shoulder bag or the Givenchy Antigona bag but apart of a much better price tag I just love the straight and clean lines of the Micheal Kors Selma. It is such a classy design and the leather just stays in an impeccable shape even after wearing it on a daily basis. Trust me I know because I already own the black MK Selma cross body bag and use it all the time and still looks brand new. It shows that the Selma bag is a go-to bag for every day use and in a gorgeous color that pops, it was just the thing that I needed. I got obsessed with this bags color which name is: Mandarin, but it looks like a bright tomato red to me not really like a mandarin at all LOL. I was disappointed the MK Selma in this hue was sold out everywhere. I tried my luck on marketplace.com (Dutch e-bay) and found one, can you believe just one person selling it in that same color I was looking for. Lucky, lucky me! To top it all, it was brand new and in a perfect state! I thought; how could anyone want to sell such a perfect bag? After meeting the bags very pretty and quirky owner who was quite the fashionista herself, I found out she is a fierce lover of “all black” outfits. Colors are not her thing, So after carefully saving money to be able to buy this bag, it ended up collecting dust in her closet. After chatting for a few hours I had made two new friends. This red MK beauty and it’s lovely former owner who was happy to pass it on to someone who would treat it with great love and care. Yes, us bag lovers talk about our bags as if they were our babies. So off I went with my new red love and in complete bag heaven. Can you guys relate? I have a feeling you do! Thanks for reading everyone and remember you only have ONE more day left to enter my Dior giveaway with a chance for you to win a luxurious Dior Necklace. Click here to enter! "Win a Luxurious Dior Pendant Necklace"